Eggs, especially egg whites, are a staple in any bodybuilder's diet because they are low in calories and fat yet high in protein. Although eggs are perfect for bodybuilders, you can still become bored with them. Fortunately, eggs and egg whites can be substituted with other protein sources or be prepared using different cooking methods to create a greater variety. Protein intake for bodybuilders varies depending on if they are increasing muscle mass or maintaining muscle tissue. Daily protein intake for increasing muscle mass should be between 0.72 and 0.81 grams per pound of body weight; whereas, for muscle maintenance only 0.54 to 0.64 grams are necessary, according to the United States Anti-Doping Association. Whey protein powder is a simple alternative to eggs. Like eggs, whey protein is easily digestible, low in calorie and high in protein. Additionally, protein powder comes in a variety of flavors and can be mixed with water or milk into a shake. It can also be added into your morning oatmeal for added protein instead of eating egg whites. Replace eggs and egg whites with other meat sources such as lean chicken or turkey breast, fish or lean beef. Fatty cold-water fish such as salmon, tuna and trout contain essential omega-3 fatty acids that offer numerous health benefits. Aside from reducing bad cholesterol levels and your risk for heart disease, omega-3 fatty acids also have anti-inflammatory properties, which can be beneficial for bodybuilders. Replace at least two of your egg meals with a 3-ounce serving of fish a week. Quinoa is a seed from a flowering plant and is an excellent replacement for eggs in a bodybuilding diet. Quinoa is a complete protein source, containing all nine essential amino acids and a 1-cup serving size contains 8 grams of protein, notes Tosca Reno, author of "The Eat-Clean Diet Stripped." Quinoa can be prepared with water, broth or juice and mixed with vegetables, other meats or fruit for a variety of flavors. Other plant sources include beans, tofu, legumes and grains. With one large egg white containing only 17 calories, 0.1 grams of fat, 0.2 grams of carbs and 3.6 grams of protein, you may wish to stick with egg whites, but prepare them using different flavors or options. 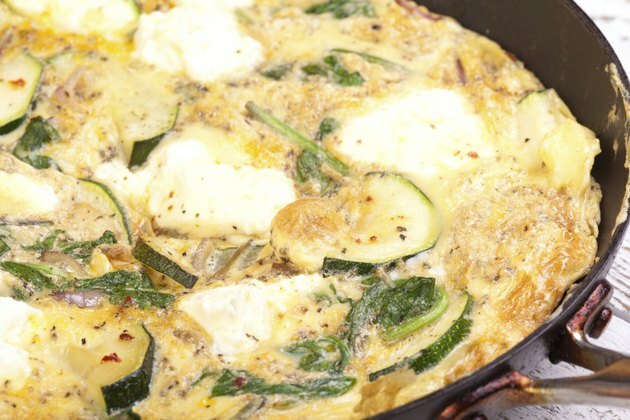 Try an egg white frittata using different vegetables such as onions, mushrooms, peppers, asparagus or broccoli. Adding in other meat or plant proteins, such as diced chicken, shrimp, quinoa or black beans, can make plain eggs more flavorful. Experimenting with different herbs and spices can also create more variety in egg dishes.